Sonnenburg Builders doesn’t play number games just to win a bid. We’re proud of our A+ rating with the Better Business Bureau, and we simply will not nickel-and-dime our clients. While cost overruns can and do happen for honest reasons, the best way to control remodeling costs is to plan your kitchen or bathroom remodeling, home addition or new home construction project in advance down to the smallest detail. From the windows and doors down to the cabinet hardware, we include the actual materials price in every quote, taking the guesswork out of our estimate, and protecting you against surprise costs. We have many different showers on display including low-barrier showers as part of our senior-friendly bathroom design. Or try out a new kitchen faucet while planning your kitchen renovations—we have great brands to choose from including Delta. Sonnenburg Builders carries all the top brands in home improvement and we provide homeowners throughout Manitowoc County with unbeatable value from replacement windows to installing safety grab bars anywhere in your home. 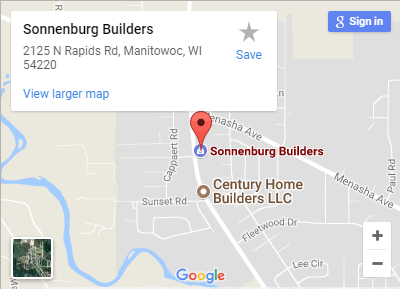 Our Manitowoc showroom sets Sonnenburg Builders apart from other Wisconsin contractors. Listen to our Lifestyle Remodleing Show to hear about our fully functioning displays. Contact Manitowoc’s best home remodeling contractor today for a free estimate!